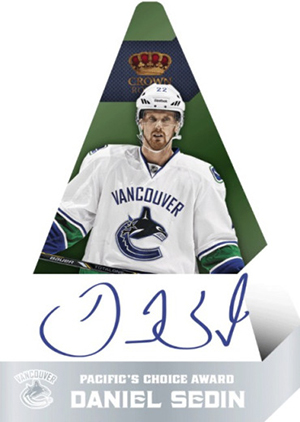 Regal reigns supreme in 2013-14 Panini Crown Royale Hockey, a hit-per-pack product highlighted by a new lineup of Silhouettes autographed memorabilia cards. Boxes of the high-end product come with four packs per box. Every pack comes with either an autograph of memorabilia card with one signed card guaranteed in every box. Silhouettes are one of the hobby's most recognized hits. The cards have a die-cut player image on the front. The memorabilia window is large and layered underneath. They're rounded out by an autograph at the bottom. Silhouettes land approximately 1:3 boxes. The checklist includes both rookies, veterans and retired greats. Panini's Choice Autographs are another carryover from Pacific, the company that introduced the Crown Royale name. 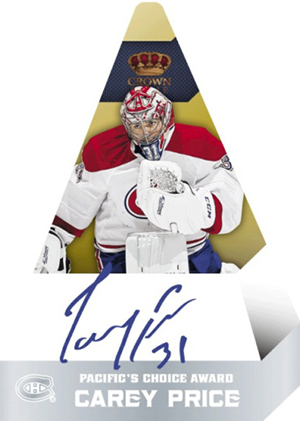 Coming in four different colors, each with a different rarity, Panini's Choice Autographs are shaped like a pyramid. 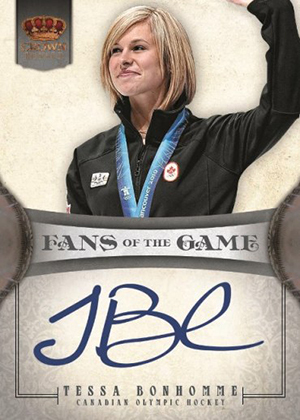 Fans of the Game autographs highlight famous personalities who enjoy their NHL hockey. Voices of the Game delivers signatures from TV announcers and singers who have belted out national anthems before NHL games. 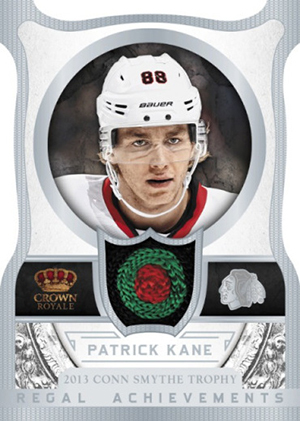 Among the memorabilia cards in 2013-14 Panini Crown Royale Hockey are Heirs to the Throne and Regal Achievements, both of which include die-cut designs. Like previous incarnations of the brand, base cards come with a die-cut look with a crown at the top of the card. 2013-14 Crown Royale 1 1 Silhouette Patch 25 25 Panini 13 14 #S-MXT Prime Max !! 2013-14 Crown Royale AUTO 25 MARK STONE Sovereign Sigs Panini 13 14 Rookie SP ! Announced print run is 99 per card. Short Prints are noted below. SP = 75 or less. Announced print run is 100 per card. Short Prints are noted below. SP = 50 per card. Short Prints are noted below. SP = 50 or less, SSP = 25 per card. Short Prints are noted below. SP = 75 per card. Short Prints are noted below. SP = 50 per card, SSP = 25 per card. Announced print run is 99 per card, or less. Short Prints are noted below. SP = 25 per card, SSP = 10 per card. Short Prints are noted below. SP = 75 per card, SSP = 20 per card. Base cards are one of the nicest in the price range. Hits were okay for the price. If my Heirs to the Throne – card that I got from the hobby was not damaged I�d give this product 4 stars. 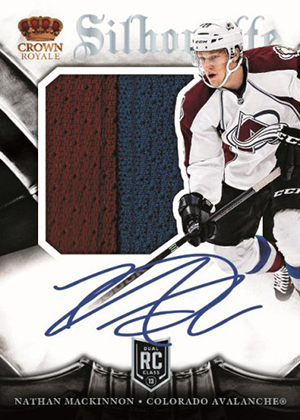 2013-14 Crown Royale Factory Sealed Hockey Hobby Box Nathan MacKinnon AUTO RC?